Ethel M. Greenlee, 93, passed away at 12:55 p.m. on Thursday, Sept. 13, 2018, in the Pilgrim Manor at Plymouth following a brief illness. Ethel was born the daughter of Swedish immigrant Fred “Fritz” and Josephine Bergman in Duluth, Minn. They settled in the Donaldson area, and she graduated from West High School in 1943. On June 17, 1947, in Donaldson, Ethel married Lowell R. Greenlee and together they raised three sons: Robert, Phil and Larry. They shared 64 years of memories prior to the death of Lowell on July 17, 2011. She was a fun loving wife, mother to many, grandmother and friend. She was known for her cooking skills highlighted by her Swedish pancakes. Ethel was an accomplished artist, seamstress and Sudoku player. For many years she upholstered furniture for others at her home. She was formerly active with Tri-Kappa. 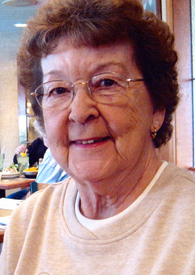 She had worked for Cook Bros., VanGilder and Muday Furniture Stores in Plymouth. She retired at the age of 62. She took great pride in her entire family. Surviving members include her three sons and their families: Robert L. Greenlee, Plymouth and daughter Gina C. Greenlee; Phil F. & Yung J. Greenlee, Plymouth, and children Debra S. (Kevin) Lockhart and Doreen S. Ruggles; Larry K. Greenlee, Ft. Wayne, and children Adam K. (Kelly) Greenlee, Drew W. Greenlee and Leah M. Rowe. Great grandchildren include: Hadley, Asia, Breanne, Rebecca, Brandon, Samantha and Kensleigh along with great-great granddaughter Raea. She was preceded in death by her spouse and one sister, Rosie Bergman. Visitation will be held from 10 a.m. until noon on Wednesday, Sept. 19, in the Johnson-Danielson Funeral Home, 1100 N. Michigan St., Plymouth. Funeral services will immediately follow at noon in the funeral home with Life Celebrant James Smart presiding. Burial will be in the New Oak Hill Cemetery, Plymouth.